Fire coral is a stony or feef building coral, but not a true coral. It is more closely related to jellyfish and anemone. Fire corals are part of the phylum cnidaria, which is known as the stinging-celled phylum because they have stinging tentacles. 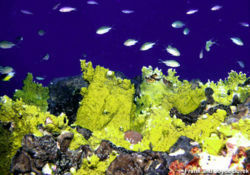 Fire corals are filter feeders to a certain point. Fire coral is often sold to people just like other corals are. This species can live in some conditions that other "true corals" cant, like where the water is more turbulent or in poor water quality. Fire coral needs a lot of lighting and a good current to grow. Being as fire coral stings it doesnt have fish chewing on it to keep the algae level down. So they are just generally left alone by other animals. a close up of a fire corals stinging-cell tentacles. Fire corals look somewhat like any other coral but they aren't as colorful or as beautiful as some other corals. They come in all different shapes, color and size. Fire coral is with the hardiest cnidarians group. Fire corals are true reef-builders. Fire corals reproduce with free swimming Medusa which are produced in sexual generations. They also reproduce asexually by breaking and splitting that then creates a new individual. 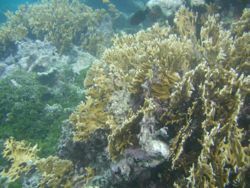 You can find fire corals in places with poor water quality than many true corals although good filtration and water flow is needed. The fire corals need a lot of light. Fire corals are also better in areas with more current. These corals do very well in brisk, refreshing salt water. 5-30 minutes after you have touched the fire coral you will get a burning sensation. A red rash will appear it will have wheals rising and the itching will set in. Over time swelling may happen. And on some occasion vomiting and/or nausea. Rinse the wound with seawater NOT FRESH WATER. Fresh water will increase the pain from the wound. After you have rinsed the wound you should rub on ether vinegar or isopropyl alcohol, which are also known as topical acetic acid. If there are any tentacles in the wound remove them with tweezers. YOU SHOULD NOT MOVE AROUND AFTER A FIRE CORAL HAS STUNG YOU!!! If you do the venom will spread faster. After you have done all these steps rub on some ant itch cream or hydrocortisone cream 2-3 times a day. This page was last modified on 21 June 2010, at 00:26.